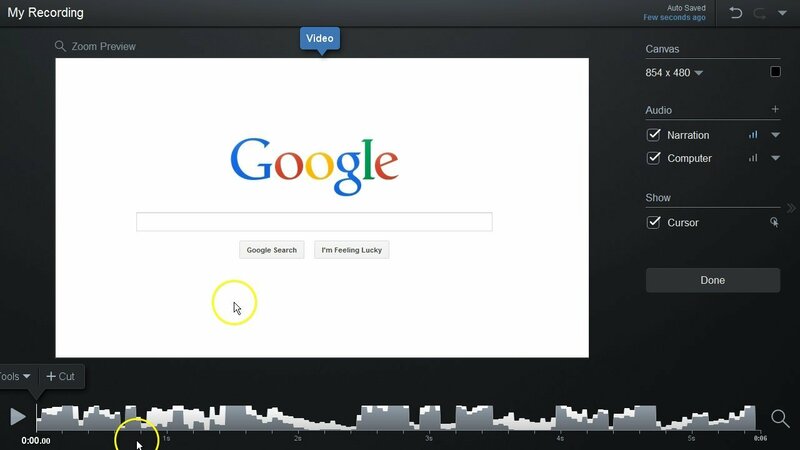 0:00 To modify the volume levels over a section of your recorded video you first seek to where you want to start then click the "Tools" menu button above the timeline and select "Volume" or you can just press the "V" key to start the tool. 0:12 Select the section to replace by dragging the pink bar along the timeline or if you click on the start or end of the span then you can use the arrow keys to fine tune your selection. 0:22 You can also click around the timeline then use the "S" key to jump the start to that point or the "E" key to jump the end to your current seek point. 0:31 To modify the volume over the selected section you choose which audio you'd like to edit by clicking one of the available options. On this recording we have botth narration and computer audio. Clicking Narration we get options to reset the levels if we previously changed them, then there are buttons to increase or decrease the levels which you can press a few times to get the effect you want, or you can choose to silence the volume over the section. 0:56 When you make a change you'll see the levels changing on the timeline and the icon here will change to show that a change was made. 1:04 To preview what the volume sounds like you can press the Preview button which will seek right before the section and start playing and stop shortly after the section. 1:12 Once you're ready to commit you press the OK button or the Enter key	1:16 Anytime you add an edit to a recording it is automatically saved on your computer. 1:21 After the volume change is added you'll see the audio levels colored pink on the timeline showing where the change was applied. If you want to remove or edit you can seek back to that spot on the timeline then click this icon which will bring up back up the controls to adjust the volume or you can use this icon to remove the edit. 1:39 You can also use the undo or edit history drop down to go back in time before you added the edit if you'd like to remove it. 1:47 The last used tool will be listed next to the Tools button above the timeline so you can easily use the same tool again by clicking on it here. 1:55 Besides using the Volume tool you can also adjust the overall volume levels by clicking the bars next to the Audio entries on the right. See our other Editing Audio tutorial for more help with that.